Although climbing Colorado’s 14,000-foot peaks has become increasingly popular in recent years for both state natives and visitors, many of the best climbs in the state are actually 13,000-foot peaks. With an even mix of hikes, scrambles, and climbs, as well as an average of almost four routes per peak, there is something for everyone in Colorado’s Thirteeners. 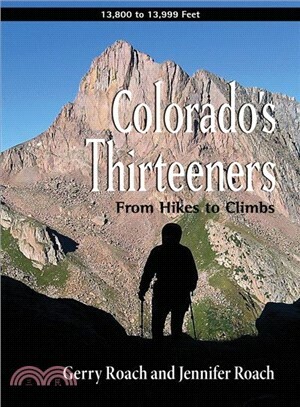 This book includes accurate and user-friendly information on 59 major peaks in six mountain ranges; 202 routes on the major peaks; 71 routes on 71 additional peaks; 96 trailheads with detailed driving directions; distance, elevation gain, difficulty scale and effort rating for each route; and full-color, annotated illustrations. Gerry Roach has climbed in dozens of states and countries, including 28 Alaskan expeditions, 10 Andean expeditions, and seven Himalayan expeditions. After climbing Mt. Everest in 1983, he became the second person to climb the highest peak on each of the seven continents. He lives in Montrose, Colorado, with his wife and climbing partner, Jennifer Roach. Jennifer Roach is an expert on Colorado’s mountains, who has climbed all of its Fourteeners, Thirteeners, and most of the Twelvers. She has led many Colorado Mountain Club and is also a coauthor with Gerry of Colorado’s Lost Creek Wilderness.